Women’s World Chess Champion Alexandra Kosteniuk chronicles her rise to the top of the chess world in this introspective autobiographical work. Drawing from personal diaries kept during her youth, Kosteniuk takes the reader from the very dawn of her career as a child star in Russia, through triumph and disappointment, and finally to the pinnacle of success on the black-and-white battlefield. Along the way, we are treated to much more than an inside look into how a grandmaster approaches the royal game: we also learn the unique challenges posed to a young woman pulled at once by the diverging demands of professional chess, the glamour of the modeling lifestyle, and the joys of love and family life. 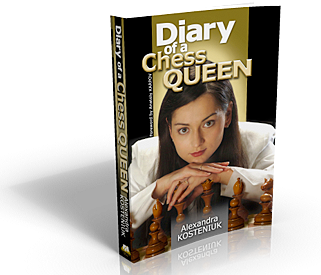 Part memoir and travelogue, part game collection, Diary of a Chess Queen features a selection of 64 annotated games with a wide range of world-class competitors, including male super-GM Sergey Karjakin and former female world champions Zhu Chen and Antoaneta Stefanova.